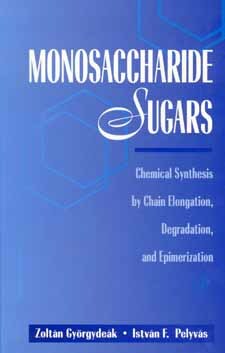 In a single volume, Monosaccharide Sugars critically summarizes the applied and potentially useful strategies for the synthesis and degradation of monosaccharides by chain-elongation, degradation, and epimerization. These methodologies permit the synthesis of rare or unnatural monosaccharides that are frequently employed as chiral building blocks in natural products synthesis, as well as for producing sugar derivatives labeled with radioactive isotopes. Representative and well-established experimental procedures are provided to illustrate the potential of the synthetic transformation. Degradation of carbohydrates also represents an invaluable tool for the structural elucidation of certain natural products, such as glycosides, antibiotics, and polysaccharides. When describing the individual methods, unique supplementary collections of the prepared sugar derivatives are shown in tabular form. This compendium will eliminate tedious literature searches for those engaged in research and teaching on the chemistry and biochemistry of saccharides and other natural products, and also for those working on the medicinal and metabolic investigation of related substances of biological importance.